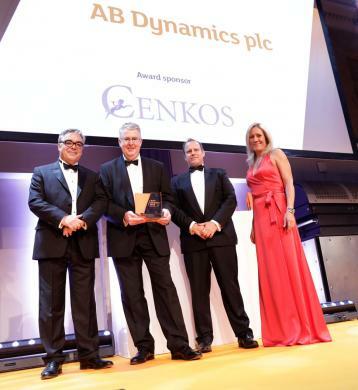 AB Dynamics, a supplier of innovative, high quality test equipment to the global automotive industry has won the Global Achievement Award at the 2018 AIM Awards. AIM is one of the most important platforms to help smaller and growing companies raise the capital they need for expansion. The Global Achievement Award, sponsored by leading securities firm Cenkos, is presented to a UK-based AIM company that can demonstrate exceptional achievement on the world stage, including a major overseas acquisition, contract win, joint venture, distribution agreement or opening up of overseas territories. AB Dynamics were up against Blue Prism Group, Fevertree Drinks, and First Derivatives. AB Dynamics is a trusted supplier of automotive test systems globally across a wide range of applications, from validation and durability to the development of advanced technologies for active safety and autonomous driving. Their test and development solutions are used by the 25 largest vehicle manufacturers worldwide, Euro NCAP and government agencies such as NHTSA. The company became a publicly traded company on the AIM stock exchange in 2013. Anthony Best, Founder and Non-Executive Chairman of AB Dynamics said: "We're delighted to win this prestigious award, it's a great reflection of the accomplishments from our hard-working team. Congratulations to the whole company."